The principal at Fancy Pokket hired Essex after an extended search in the credit markets had come up short on financing needs to fund the Company’s US expansion. 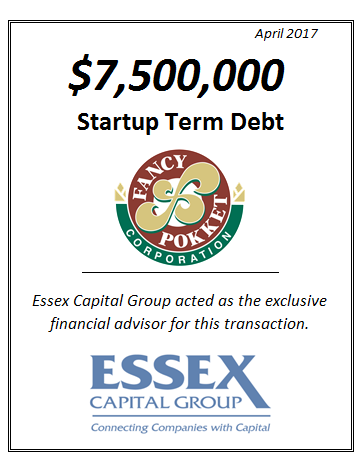 Within 2 weeks of engagement, Essex was able to arrange a financing term sheet that provided the Company with the requested debt capital. The new debt facility will allow the Company to finalize the build out and equipment installation at its state-of-the-art 58,000 square foot bakery envisioned and built from the ground up by the principal. The facility will open within weeks and will be dedicated gluten-free. Products offered in the United States will include such items as breads, baguettes, hot dog and hamburger buns, muffins, brownies and other baked goods.